The Daylesford Spa Country Railway depends on volunteer labour to maintain and operate our railway. 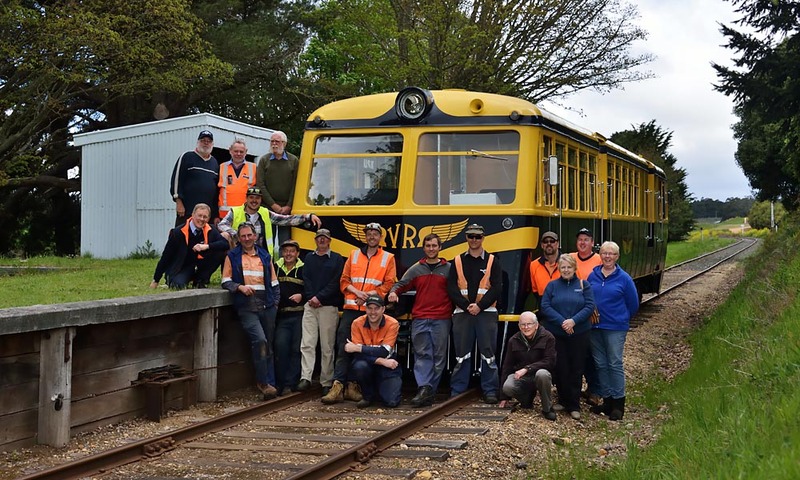 Volunteering is one of the many ways you can contribute to the preservation of Victoria's important railway heritage. There are many diverse tasks that need to be done to keep our railway operating and preserve our historic collection of rolling stock and infrastructure. Working bees are a great way to meet fellow members, develop new skills and become involved with the maintenence and running of our railway. Working bees are conducted every Saturday. Each working bee will have both a theme and a goal. Track maintenance will still be one of the tasks as it is essential to keep our railway operating. However, other more diverse jobs such as trolley maintenance or railmotor restoration will be looked at where possible. For more information about becoming a volunteer, please contact Stuart at ssmithwick1@iinet.net.au or ring 0409 351 901. The Daylesford Spa Country Railway is operated and maintained by The Central Highlands Tourist Railway. The CHTR is a non-profit volunteer company. New members are always welcome and there is a spot in the company for any enthusiast. Membership is A$30.00 inc GST per year and includes a subscription to our quarterly newsletter "The Turntable". Please click here to download a printable membership from.